Fox News uses the GLAAD-defined defamatory slur 'gender-bender' to refer to Chelsea Manning, adding to the network's long track record of deprecating trans individuals. This morning, Fox News continued its streak of insensitive coverage of trans issues when on-screen text referred to Chelsea Manning as a "gender bender," while hosts referred to her as "male." 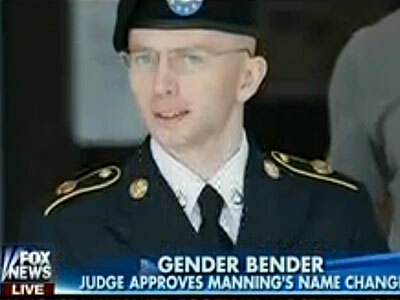 The Fox & Friends team made further factual errors, stating that Manning's birth certificate was changed — Manning's announcement said that the judge had granted her a name change, not that her birth certificate had been in any way updated — and claimed that Manning wants to be housed with female prisoners, something Manning's attorney David Coombs made clear last year wasn't the case. This is far from the first time Fox News has made Manning the source of transphobic ridicule, as Media Matters for America has fastidiously documented. Just last month, during Fox News' The Five, on-air personality Andrea Tantaros referred to Manning as "Bradleen." Days before that, the network ran a segment about Manning filing the official paperwork necessary to legally change her name, referring to Manning as "him" and "he" throughout. Last August, in the immediate aftermath of Manning's announcement that she is transgender, Fox & Friends introduced a segment about the WikiLeaks source by playing Aerosmith's 1987 single, "Dude Looks Like a Lady." America's Newsroom host Gregg Jarrett defended his intentional misgendering and misnaming of Manning by saying, "I don't do what Bradley Manning wants me to do," and telling his audience, "Don't send me angry emails that I referred to him [sic] as 'Bradley' and not 'Chelsea' and 'him' instead of 'her.'" Fox News host Jon Scott once referred to Manning's transition as a "ruse," and claimed that transgender individuals weren't living in "reality." As is often the case when Fox News flaunts mainstream style guides which instruct journalists to use the person's preferred name and personal pronuns when reporting on trans individuals, Scott denounced these efforts as "political correctness run amok." That same week, Fox & Friends mocked other outlets' announcements that they would be referring to Manning by her correct name and pronouns, warning viewers to not be "deceived" by news outlets that referred to Manning using these pronouns. But Fox's coverage of Manning is just one aspect of its problematic pattern of reporting on transgender people. Resident "expert" Dr. Keith Ablow regularly goes on transphobic rants while discussing Chaz Bono and transgender kids, the network has repeatedly used of photos of Robin Williams in Mrs. Doubtfire to illustrate stories about trans individuals, and Todd Starnes has referred to transgender women as "burly men in dresses." Additional problematic portayals include the repeated labeling of trans-inclusive nondiscrimination bills as "bathroom bills," and Bill O'Reilly's consistent misgendering of convicted murderer Michelle Kosilek. For years, groups ranging from the National Center for Transgender Equality to GLAAD have asked that Fox News stop misinforming viewers about the lived experiences of transgender individuals, though the network has yet to formally respond or change its ways.